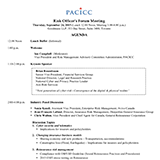 PDF of the agenda for the October 31,2018 Risk Officer’s Forum Meeting. PDF of the agenda for the September 5, 2018 Risk Officer’s Forum Meeting. PDF of the agenda for the April 5, 2018 Risk Officer’s Forum Meeting. 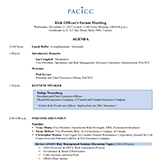 PDF of the agenda for the November 15, 2017 Risk Officer’s Forum Meeting. 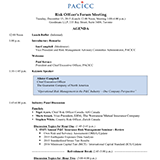 PDF of the agenda for the September 27, 2017 Risk Officer’s Forum Meeting. PDF of the agenda for the April 20, 2017 Risk Officer’s Forum Meeting. 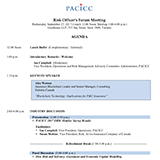 PDF of the meeting agenda for the November 23, 2016 Risk Officer’s Forum Meeting. 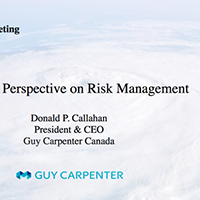 PDF of the November 23, 2016 Risk Officer’s Forum Meeting presentation by Donald P. Callahan. 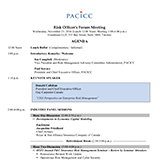 PDF of the agenda for the September 28, 2016 Risk Officer’s Forum Meeting. 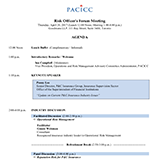 PDF of the agenda for the April 14, 2016 Risk Officer’s Forum Meeting. 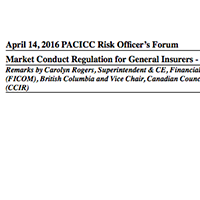 PDF of talking points from the April 14, 2016 Risk Officer’s Forum Meeting by Carolyn Rogers. 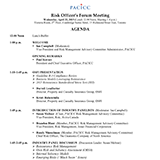 PDF of the agenda for the December 15, 2015 Risk Officer’s Forum Meeting. 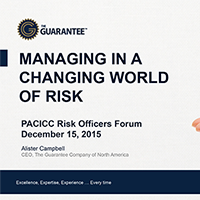 PDF of the presentation give at the December 15, 2015 Risk Officers Forum Meeting by Alister Campbell. 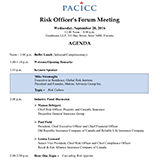 PDF of the agenda for the September 24, 2015 Risk Officer’s Forum Meeting. 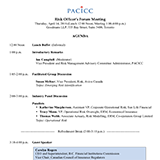 PDF of the agenda for the April 22, 2015 Risk Officer’s Forum Meeting.